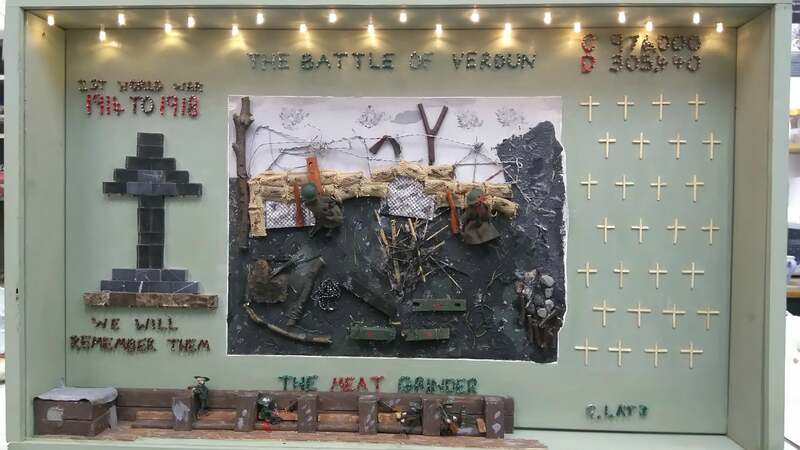 This is a WW1 commemorative piece, depicting a trench scene from The Battle of Verdun in France. This was longest single battle of WW1, fought between the French and German armies from 21th Feb to 18th Dec 1916. It was nick-named "The Meat Grinder" as it was so bloody and resulted in a magnitude of casualties and deaths, an accurate figure of which will probably never be known. The impact of the battle on the French Army was a primary reason for the British starting the Battle of the Somme in July 1916, in an effort to take German pressure off the French at Verdun. The artwork is set in a box display frame, with a toughened glass front and battery-powered LED lights. It is a mixed media piece, painted in acrylics. The detailed scene has been created using various materials including stones, twigs, sand, metal and wire. The sandbags are made from jute shopping bag handles, the cenotaph from glass & granite tiles and the crosses from matchsticks. The soldiers are made from copper wire, one has been shot. The numbers at the top right corner signify the estimated total casualties and deaths as a result of this battle, at the time of Geoff's research.